A while ago, we asked for your opinion on a few upcoming OS releases in the mobile realm. 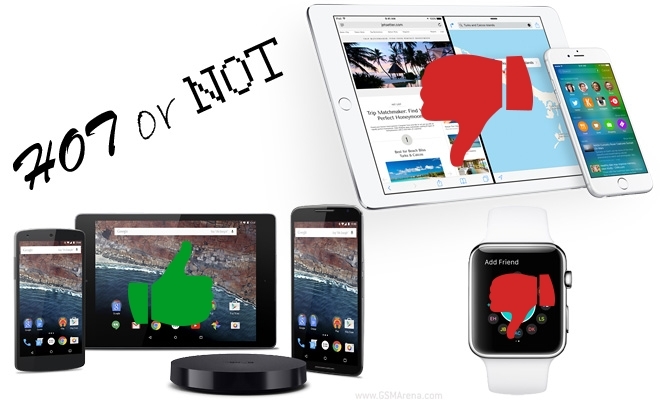 You’ve had some time to think and to evaluate the contenders and now it’s time to see what you think of Android M, iOS 9 and Watch OS 2.0. Results are in and, for the better part, they are conclusive, but we do suspect some Apple “bashing” might have occurred as well. The latest version of Google’s popular mobile OS might still be lacking an official desert title, but it is here and already running, in beta at least, on most Nexus devices, and even, more recently, on some Sony ones as well. Hopefully, this gave you a chance to get acquainted with the new permissions model and Google Now On Tap and find out if they are your cup of tea. Also, the developers out there might already have some feedback on the new built-in fingerprint API, as well as the improved Chrome WebView. This being said, we hope you made an educated vote, because the end result was a resounding outburst of joy for Google’s new Android OS. We can’t wait to get our hands on the final version either. Apple’s new mobile OS release didn’t really fare so well in our vote. This is slightly odd, considering that Cupertino brought in quite a few interesting features. Split-screen multitasking, for instance, has been a long awaited option, not to mention a much-requested one. It is finally coming, but the fact that it will be available in its full potential only on the iPad Air 2 is kind of off-putting and we understand if you had to deduct some points on this ground. However, all the other changes, like info cards in Siri, transit directions in Maps and the new keyboard trackpad feature all sound exciting and were probably the reason for all the upvotes iOS 9 received. At the end of the day, however, pessimism outweighed eager fans and you said “nay” to iOS 9. OK, with the way the votes are distributed it was more of a maybe. Finally it’s the Apple Watch and its new OS 2.0. It didn’t really get much love, quite the opposite. It got quite severely downvoted and even that sound like we are sugarcoating it. We do, however have a plausible explanation for all the disinterest toward the new OS. First, there is the Apple bashing thing we mentioned earlier, although it’s not just that as iOS 9 did much better. A more probable explanation is that most of the new features feel like they should have been part of the original firmware and not come shortly after. The general vibe we get is that Apple rushed to out the Watch and is now filling in the holes, which is by no means ideal, especially for early adopters and developer, who now find a lot of their work obsolete. The numbers are clear enough and it really seems like Apple’s upcoming Watch OS 2.0 didn’t quite win you over. A resounding “nay” here.